# Wash the cornelian cherries, drain their extra water. # Put the cornelian cherries into the pot, and add 2 cups water in it. # Cook over medium heat until the cornelian cherries grow up and their seed get away, remove it from the stove. 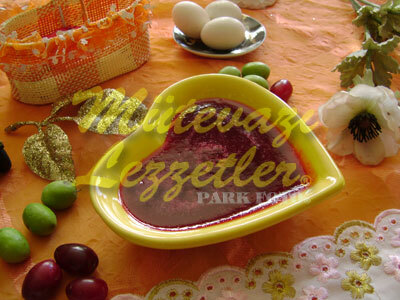 # Place the tepid cornelian cherries into a colander, and get its puree by mashing it by the help of a spoon. Keep doing it on until get their seed on the colander. # Place the puree into the pot, add 2.20 pounds sugar in it, and cook it over medium heat by stirring time to time. # When it turns to thicker consistency add the lemon juice and cook for 5 more minutes, remove it from the stove. # Fill the tepid marmalade into the jars. Note: The cornelian cherries turn thicker consistency quickly during the cooking, because of that you should be careful while cooking the marmalade.